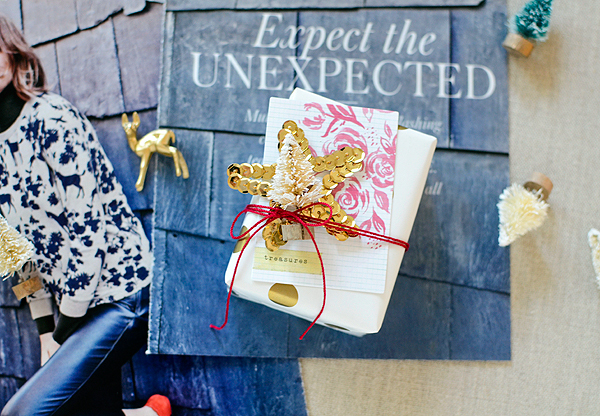 This month, I'm borrowing a few of my Gossamer Blue projects for the kick off of my first 25 Days of Gift Wrapping series. If you come around here often enough, you might be aware that I love wrapping gifts! 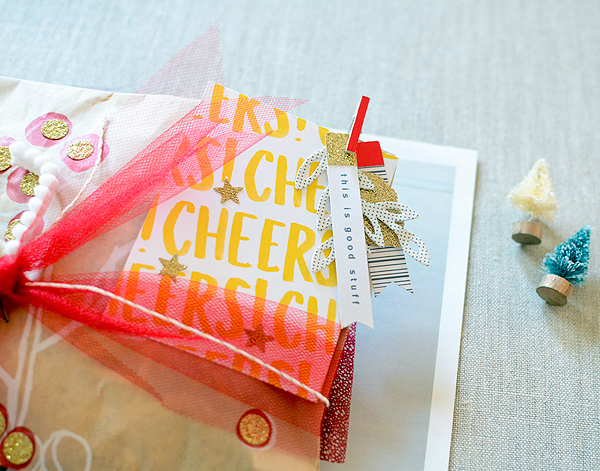 From wrapped packages to decorated bags--and the gift tags that go with them--I adore it all. So with the holiday wrapping season in full swing, I got a wild hare--a really wild hare--to share 25 days of different wraps with you. I'll make the disclaimer right now that I won't be blogging every single day until Christmas (you see I'm already 3 days late!). Yet I will be posting festive packages every couple of days with a tip or technique, and after playing catchup on Instagram later today, I'll be sharing a wrap every day over there. My first theme is to expect the unexpected. 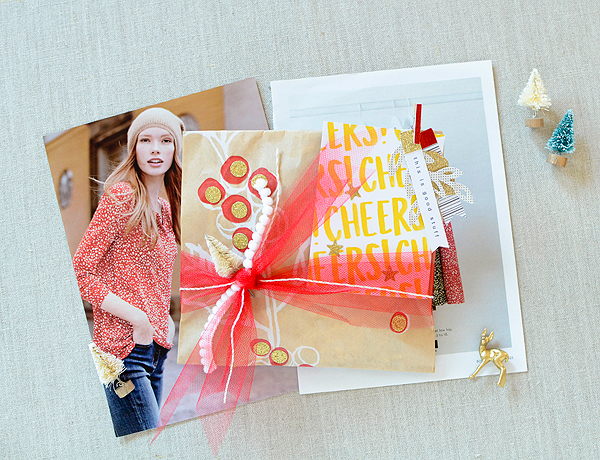 I created these packages with the December kits from Gossamer Blue. Since they released all the Christmas-related kits last month, I challenged myself to use nontraditional color schemes and wrap my gifts with products that were not intended for Christmas. Shall we see how they turned out? *In addition to the GB December kits, I also used a few easy-to-find embellishments like tulle and twine, bottle brush trees, and miniature deer (all found at craft stores like Michael's and Joann). And if you're wondering about the backdrop for my photos this month, I tore pages out of a wintry Boden catalog; I was feeling like I needed to change up the simple white background and I must tell you, I'm so glad I did! This teeny gift is my favorite of today's bunch. 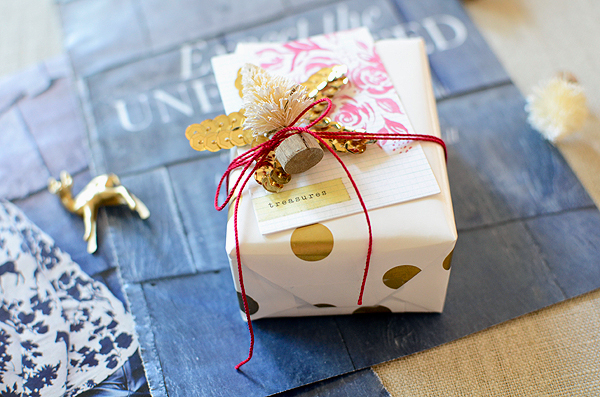 I wrapped my gift in gold-dotted paper from Paper Source and then embellished with 4 simple elements. From the beginning, I knew I'd be using the gold sequin star for one of the gifts and when I paired it with the faded red floral 'treasures' card, it was instantly festive! 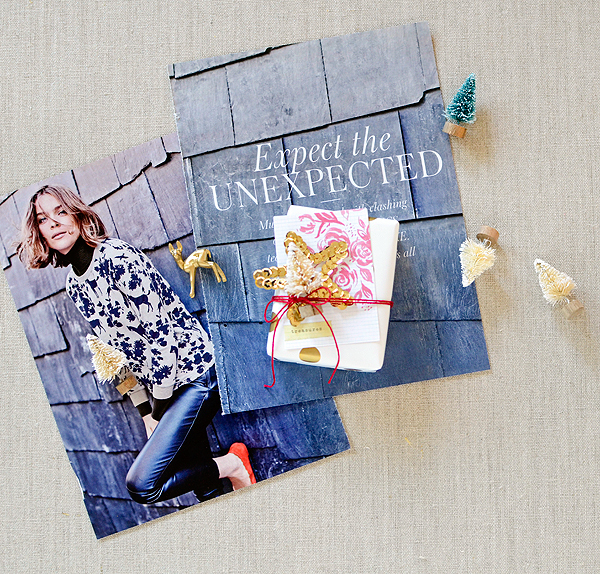 By adding the red crochet thread and tiny sisal tree, it's most definitely a sweet gift to slip into a stocking. Pink, yellow, and teal green are not your mother's Christmas colors (at least they never would have been my mother's!). However, when you mix them with gold, another bottle brush tree, and the mini plastic deer (that I spray-painted gold), it sure looks Christmasy to me. Oh, and using the word JOY always works! 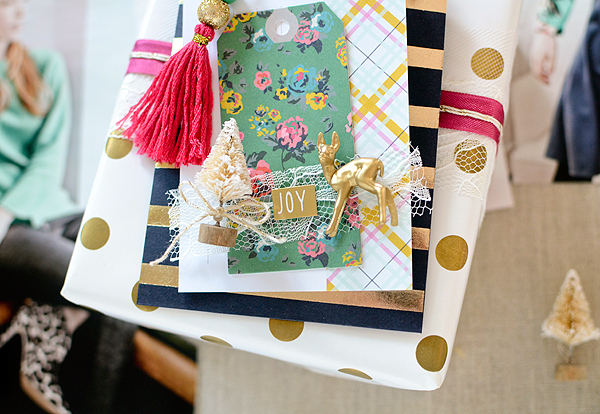 I layered the floral tag on a colorful Life Pages card, which I then adhered to a black and gold treat bag--those bags are awesome and so saturated in color! I put a handful of red tinsel (from Walmart) inside the bag, which gives the package a festive pop. And then there's the tassel! 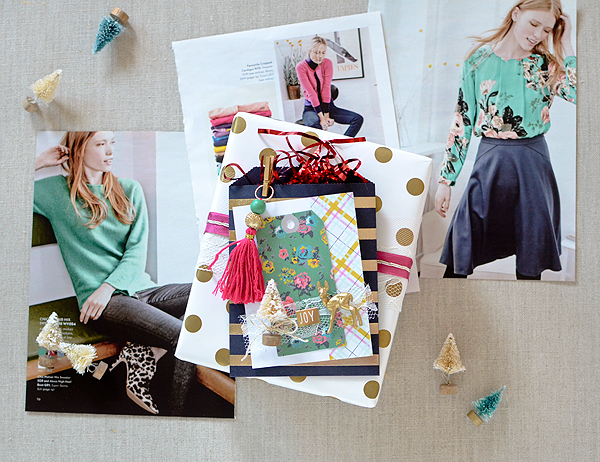 I've been going tassel-mad lately so I was all heart-eyes to see these by Maggie Holmes in the Bits & Pieces kit. I guess this means I have to step up my tassel-game with some glittered and painted wood beads! If you're going to give a food treat, why not use food-safe packaging, like this Starbucks bag I used to wrap up some chocolates. The bag already has a holiday design and I glammed it up a bit with glitter stickers from the Themed LP kit. I tied on a couple different trims and another little tree and the rest is all GB! The 'CHEERS!' 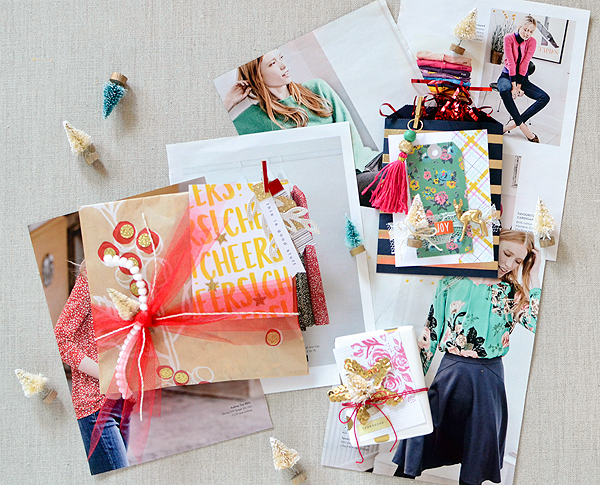 LP card is bright and happy (and I love to pair red and yellow together) and 'CHEER' is one of my favorite Christmas words, so while it's intended purpose may have been to celebrate the New Year or a means of congratulations, it makes a fantastic holiday tag, too. I always like to layer a few small pieces with a larger piece so I combined skinny flag tags by Basic Grey (adding glitter and foil tape to their tops), with die cut leaves (the glitter leaf is from a November 2014 GB kit). If we imagine this was a present a day for the first 3 days of December, I'm all caught up with 25 Days of Gift Wrapping--until tomorrow :) And do get your GB kits now if you haven't already--you can do so many different things with them and DO NOT miss the Gallery this month. If you ever need inspiration, I'm telling you, you'll find it in there! Beautiful packaging as always! I love the tiny deer spray painted gold, that's so cute! I'm looking forward to this series!